AT&T recently began selling the Pantech Link II, a follow-up quick messaging device that includes a back-lit QWERTY keyboard for typing. The Link II also features a 2 megapixel camera with video capture, Bluetooth 2.1, media player, support for microSD cards up to 32GB, speakerphone, and a number of messaging and social networking applications. 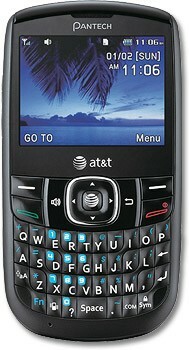 The Pantech Link II is available from AT&T.com for $9.99 after rebate with a new agreement. Samsung today announced a range of Universal Flash Storage memory cards meant for today's intense video applications. The UFS spec has been used for embedded memory modules since 2015, but this is the first time UFS has appeared in removable memory cards. 👿 AT&T apparently thinks that anyone who wants a good keyboard does nothing but text. That's he only conclusion I can draw from their steady flow of cheap QUERTY featurephones and total lack of high-end QUERTY smarthphones. Meanwhile, I can get a perfectly acceptable solution on every other carrier. AT&T: We Ain't Got An Effin' Clue(tm). how I found out about phone releases and plan changes through PhoneScoop before I'm told by AT&T themselves. Beautiful communication skills there. Beautiful. with Sprint..found out about the new return policy on here before Sprint said anything on our system..glad we were/are trained on the new return policy..we still don't know ish on it because they haven't provided us with clear M&P's. What, you want a phone call? How are they supposed to 'notify' you?